The Province o Syracuse (Italian: Provincia di Siracusa; Sicilian: Pruvincia di Sarausa) is a province in the autonomous island region o Sicily in Italy. Its caipital is the ceety o Syracuse. It haes an aurie o 2,109 km², an a total population o 396,167 (2001). 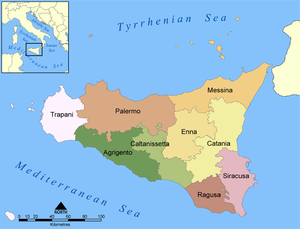 Syracuse haes 8% o the Sicilian population an 8.2% o Sicily's aurie. It is bordered on the north an north-wast bi the Province o Catania an on the wast bi the Province o Ragusa. This page wis last eeditit on 10 Mairch 2018, at 22:22.